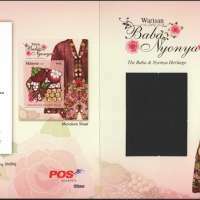 The Nyonya Kebaya says it all, without revealing all. It evokes a romance of the past, when Nyonyas stood proud yet demure in sheer silhouttes of wonderfully embroidered voile blouses. 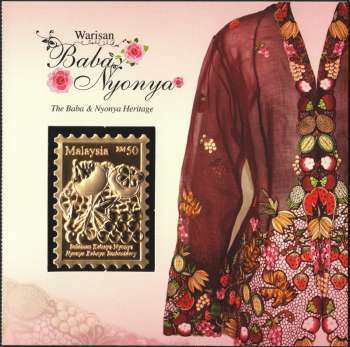 The fabric of the Nyonya kebaya is called “Kasar rubia (Voile)”. Voile is a sheer, light-weight, plain weave fabric, made of highly twisted yarns. Often made of cotton yarns, voile has a distinctive two-ply warp and is slightly heavier than other sheer fabrics. Voiles come in a variety of colours, from plain white to black, and almost every shade of blue, red, pink, green and purple in between. From the way the kebaya blouses wrapped the bodies of their wearers to the stunning colours and embroidered designs, the Nyonya kebaya is not merely a dress, it is a work of art. 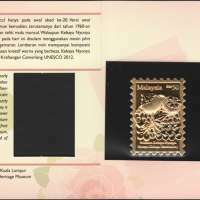 Issued on 1 December 2014, however it was only officially announced for sale on 3 December 2014 at Kuala Lumpur World Youth Stamp Exbition 2014 and caught collectors by surprise. 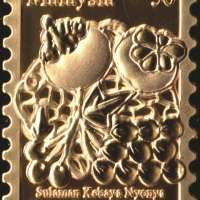 Unlike previous golden looking stamps which were printed from either golden inks or gold foil, this particular stamp is an actual plated metal. This metal stamp is valid for postage.